While using Minerva, you may see error messages, such as "This page can't be displayed" or "This page isn't working." IT Services is aware of this issue and we are actively working to resolve it. Given the random and inconsistent occurrence of these errors, it has been difficult to identify the root cause. However, we have noticed a greater occurrence of this error with Internet Explorer Microsoft Edge. Avoid Internet Explorer and Edge browsers. If you are using Internet Explorer or Microsoft Edge, try switching to Chrome or Firefox. Refresh the page. Click the browser's refresh button. This will usually bring the Minerva site back to the page you were last viewing. This may require re-entering information in form fields. Report the issue. 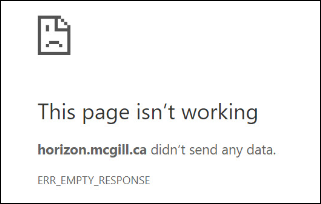 If you encounter the issue when using a browser other than IE or Edge, please report it to the IT Service Desk by calling 514-398-3398. It will be of great help if you can take a screenshot of the Minerva page you were working on just before the error occurred (with the URL of the page showing), as well as provide the date and time of the error, and your operating system and web browser. Thank you for your patience and understanding while we work to resolve this problem.